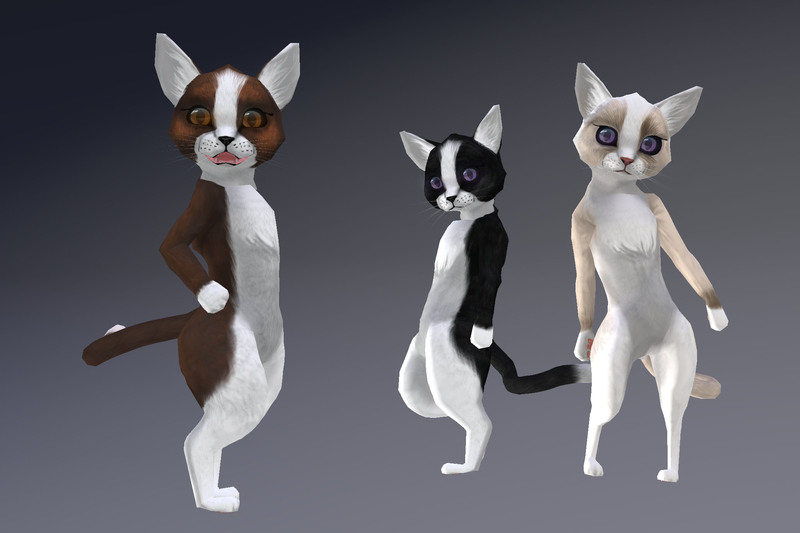 Today, I’m glad to announce that the Kitten avatars are undergoing a long-awaited update, which includes additional Bento functionality plus a brand new animation override. This updated avatar is now available in shop, along with one completely new line – the Bicolour coat pattern! If you purchased in-store prior to Christmas and do not recieve an update automatically, please come to the main shop and rez your update token (found in your original Kitten package). There may be a delay but you should still get your update that way. If it times out, please contact me (Aki Shichiroji) directly by IM. This new bicolour pattern is very much intended to reference the ‘tuxedo’ look that many bi-colour cats have. Five colours are available in this line and these new kittens will include Bento functionality, just like the updated originals! – Update system now also uses the blue circle exchanger system (Read the included notecard for full details). Known issue: RFL Purple Cheshire has not been addressed in this update but will be within the week. Please stay tuned for further info. Will the applier system used for several other recent releases also be used for the kitten avatar? – While the possibility is not closed to this, the logistics are non-trivial. The Applier system will not be applied to the kitten avatars at this time. Will dev-kits and/or clothing be made available for these avatars? – Both are being taken in to consideration at this time and both are very likely. Again, the logistics of packaging and managing a growing number of coats for this avatar are something that I need to become accustomed to before I will have time to address either. Please IM me to let me know of your interest! Will animesh support be provided with this avatar? – It’s a bit early to comment, but animesh for this avatar is quite likely. In all likelihood, Animesh support will involve a customized kit that can be dropped in, but given that these details are rather abstract, the final execution may be somewhat different. There are also some non-mesh and non-rigged components which would need to be converted for use with Animesh should a conversion occur, so I would need to account for the additional time cost for this work. Stay tuned to the Subscriber Kiosk or the in-world group notices for further news about this or other releases from Wilds of Organica! Join the Subscriber kiosk ( here ) or the in-world group ( here )! If you like what you see but don’t think it’s quite right for you, perhaps consider donating to my Patreon? Your continued support helps to produce weekly content (written, modelled, animated or otherwise) and helps to keep original content creation in Second Life! A few new items are in the works for Wilds of Organica’s debut at Candy Faire (previous years it was Organica Specialty Landscaping & Decor) – What I can talk about so far includes this new Ear and Tail release for those who appreciate the feline persuasion! These Bento-enabled and animated attachments take advantage of advanced materials to produce a realistic fluffy and furry texture. Eight treat-themed colours are available and these attachments come with an AO HUD for layering over top normal human animations! (Please note – does not come with its own human anims). Other items are also in the works, time permitting, but this is what I can talk about so far. Candy Faire opens on November 17 and runs thru December 1st! This and other products will be exclusively available there during the event! (They’ll hit the main store and Marketplace afterward) Further info on this next week! Did you know I have a Patreon account? If you enjoy this content, please consider becoming a Patron! It helps me create more like it and offers a variety of rewards. Alternatively, if you like the sorts of things that I make for Second Life, drop by my Marketplace listing or my in-world stores and check out what I have to offer! Unless otherwise noted, I (Aki Shichiroji) and this blog are not sponsored in any way. My thoughts are my own and not indicative of endorsement by any associated or discussed product/service/company.